European supermarket chains and top manufactures of processed food will be sourcing their Food and Beverage (F&B) requirements from India at the Indusfood-II trade fair organized by Trade Promotion Council of India (TPCI, sad an official release. Discussions were held with TPCI and Maria Carillo, International Director of FIAB (Spanish Federation of Food and Drink Technology) for bilateral cooperation and promotion of Indian and Spanish dairy sector. Carillo evinced keen interest in sending a delegation to India during Indusfood-II to source their raw food requirements from India. Milk plays an important role in the northern regions of Spain as it is the main agricultural produce with the dairy industry contributing to 9% of gross added value of Spanish food and drink sector. 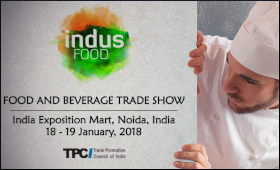 Indusfood is a tradeshow, the second edition of which will be held in Greater Noida (NCR Delhi) on January 14-15, 2019, to showcase India’s best line-up of food, beverages and agri products to global buyers. The Indusfood-I, held in early 2018, saw international buyers from 43 countries and 320 Indian exporters, from 12 categories of Food and Beverage industry, generating an estimated business of $650 million. Indusfood-II is expected to see the participation of more than 600 global buyers from around 50 countries.